Other than having been a big, over sized, thunderous puppy, we can't imagine how Thunder got his name...he seems much more like a "Corky." This is the sweetest, most gentle fur kid on four legs, yet still possesses the protective qualities of his breed. He's a large--normal weight 105 lbs..we took 5 pounds off of him to help with his broken foot--loving creature who seems to get along with all that breathes. He's playful yet calm, affectionate, and demands attention from his human family. He is house trained, crate trained (doesn't like it), leash trained and knows his basics. 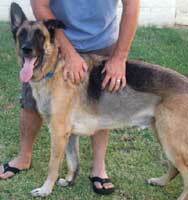 He loves kids, especially over 5 years, and has done well with other dogs, cats, tortoises and puppies. He is trustworthy when left alone with the run of the house. He's neutered, vaccinated and microchipped and has big brown eyes that will melt the toughest veneer. Mr. T is about three years young. 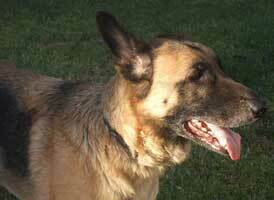 Thunder is a purebred GSD with a heart of gold. UPDATE 7/14: Physically, Mr. T is back to normal and doing fine. He will limp slightly only after he's been running around and that's becoming less and less frequent. We spent some time with Thunder at the park last weekend and discovered that he probably didn't get outside of the yard of his former owners much. It's probably why he wound up in front of a car. He did well with strangers and a strange dog but gave us the impression that he had never been in such a place...he kept a very close eye on his foster parents and sought them out for a sense of security. So while Mr. T is a very social kinda guy, he has not been well socialized with respect to the real world. His new family will need to start with walks to new places, sounds and sights and gradually into PetSmart and like environments, after which he'll be a well rounded fella. 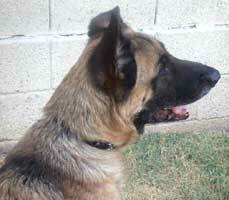 UPDATE 7/15: Thunder is a special fur kid so we're looking for a special home for him. 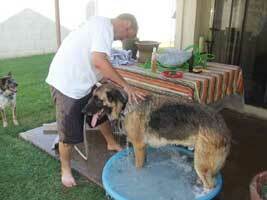 He is a very tolerant and nurturing dog yet still very much a German Shepherd. We would prefer no toddlers; children six or older would be fine. He would do well with or without a female canine...not too dominant...Thunder likes a lot of attention from his human friends. He is not a high drive or super energetic boy and will require regular exercise in the form of daily walks and traveling with his family. He's very calm in the house yet enjoys a good game of fetch with his folks. He loves and covets his Kong ball. Thunder would rather not stay home alone all day while his people are off working. If not a stay-at-home parent, at least one that works only part time. He's a real people person. 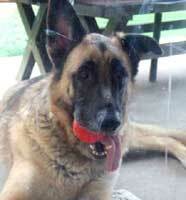 Thunder is getting very attached to his foster family so we would like him to have a family of his very own soon. He's a sensitive and emotional guy a bit on the needy side. 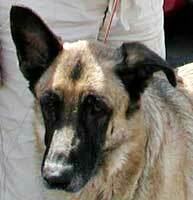 While he is friendly with other dogs, he will compete for attention from his humans. He is also very possessive of his Kong Ball..a fairly recent development. People can take it away but doesn't want other dogs messing with it. Mr. T will do fine as an only dog provided his person is around a lot...he'd probably prefer being the center of attention. A semiretired or active retiree would be perfect for him and he them; he will be their shadow. He's a breeze to walk. He's kind of a clumsy, big guy; will jump up with excitement when you get home and likely to step on little folks...no intent to hurt but capable of accidentally hurting. Visiting children are fine..a house full of very rambunctious kids too much, visiting toddlers (4 and under) will require diligent supervision. 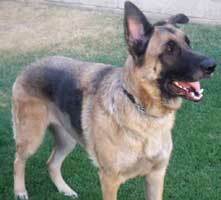 Once bonded, Thunder will be extremely loyal and devoted and want to go everywhere you do. The time has come for him to start that process. UPDATE 8/14: If Thunder doesn't find his forever home soon, he will have to find another foster home in about a week as his current foster family will have a job change requiring travel. A foster-to-adopt would be preferable; this wonderful boy deserves SOME stability now. 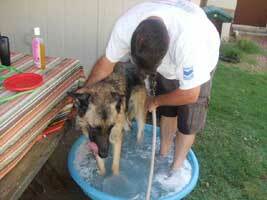 THUNDER GETS A SUMMER BATH AS TULLY LOOKS ON--WHAT A GOOD BOY! UPDATE 9/6: Thunder needs an immediate foster home...please complete a foster application SOUTHWEST GSD RESCUE FOSTER PROGRAM if you feel you can help....Thanks!